Archibald's Swiss Cheese Mountain is an award winning children's book about a little mouse with a big heart who teaches kids how to reach their big dreams! Grandma Sylvia's timeless tale has been praised for being one of the most inspirational children's books, as well as an inspiration for people of all ages to rediscover their dreams. 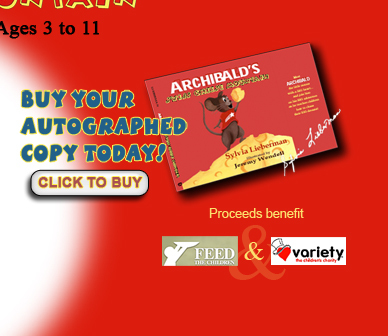 Not only will children love to have Archibald's Swiss Cheese Mountain in their library of bedtime stories, especially when it is autographed by the author, but your purchase of this book benefits Feed The Children and Variety: The Children's Charity. So when you're looking for books for kids, mouse books, picture books, animal stories or a book that will teach them to overcome obstacles, believe in themselves and make their dreams come true, look no further than Archibald's Swiss Cheese Mountain!